There’s something irresistible about chocolate. 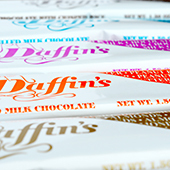 Since 1949, Daffin’s Candies has created high quality and locally made chocolates and other confections. 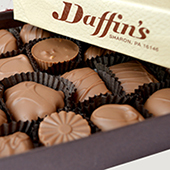 Through the passion and founding legacy of the Daffin family, Daffin’s Candies continues to produce time-honored chocolates and new sweet creations for their local community and people all over the world. Come visit one of our locations or order your favorites today! Choice assortments that are sure to satisfy everyone's sweet tooth. One of our best sellers! 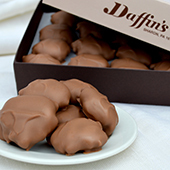 Pecans and soft caramel covered in creamy milk chocolate. Learn more about our candy bar fundraising opportunities.